Formed by two adjoining houses, Casa Josefa Villanueva was designed by the architect Julio María Fossas Martínez and conceived as a symmetrical whole, with two lines of stone galleries at either end. But the building was later refurbished and only one remains. Casa Josefa Villanueva stands out for its size. It occupies the whole corner between Carrer de València and Roger de Llúria, and is one of the most important Modernista legacies of that period. 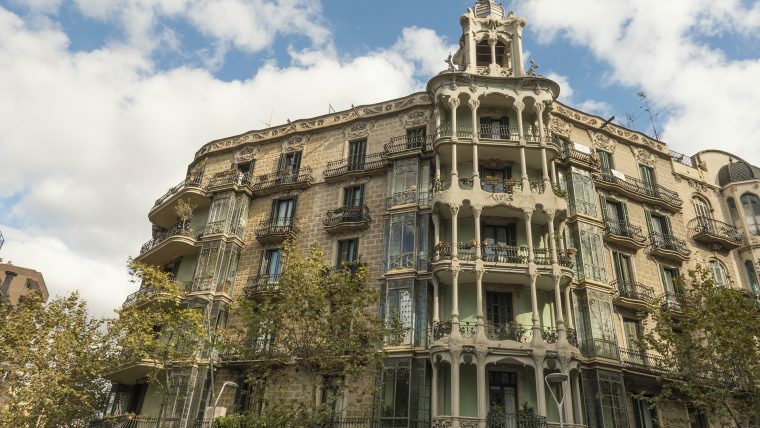 The most characteristic feature of this construction are the two adjoining houses on the chamfered corner and the elegant gallery on one of the corners, which is open, made of stone and crowned with one of the most impressive domes in the Eixample. The original design featured another gallery on the other corner but this was unfortunately lost when the building was renovated. It is also worth pointing out the distribution of the balconies across the two facades, to soften the feeling of verticality, especially on the roof terrace, which is the unifying axis of the whole construction.